If there’s one thing I enjoy in the fall, it’s football. I think that’s standard across the board. Americans love watching their favorite teams play on Sunday, Monday, and Thursday nights. It’s a deeply ingrained part of American culture that was devoid of politics until now. No, it’s not because Donald Trump slammed some in the National Football League who take a knee during the Star-Spangled Banner. This started last year when then-quarterback for the San Francisco 49ers Colin Kaepernick decided to take a knee during the national anthem. Did Trump decide to kick it up a notch? Yes—and he was counting on the media, the NFL, and the liberal pundits to go haywire, which they did. Players, owners, and anyone who doesn’t like Trump offered statements of condemnation, and the liberal media was spouting off about how this could be a culture war the president can’t win. Wrong—72 percent find Kaepernick’s national anthem antics unpatriotic. 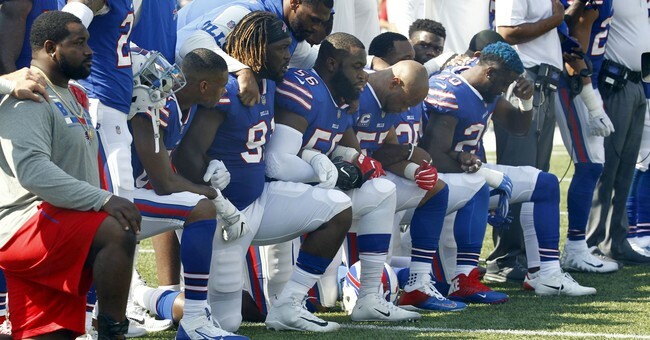 Nearly 150 NFL players defiantly took a knee during the national anthem at their games Sunday while hundreds of other grid stars locked arms with their coaches — and even some team owners — in protest of President Trump, who had ripped the league over the weekend. Three New York Giants — Landon Collins, Damon Harrison and Olivier Vernon — were among those who knelt on the field, a first for Big Blue players in the ongoing controversy over the symbolic opposition to racism. Giants’ wide receiver Odell Beckham Jr. raised his fist in a “black power” salute after scoring his second touchdown. New England Patriots quarterback Tom Brady — who supported Trump ahead of last year’s presidential election — stood with his right hand over his heart and his left arm entwined with teammate Phillip Dorsett. American democracy was healthier when politics at the ballpark was limited to fans booing politicians who threw out the first ball—almost as a bipartisan obligation. This showed a healthy skepticism toward the political class. Yet, that’s the thing, however. The Left will make you care. They will bulldoze, set fire to, sue, and brow beat you into their way of thinking. It’s a moral crusade for this insufferable horde that thinks we most all flow to their side of the arc of history, and that those who refuse to comply must be destroyed. That’s not freedom; that’s authoritarianism. Now, I would say that Trump did go a bridge too far supporting the firing and suspension of players who take a knee, but the principle of not desecrating our flag, our anthem, the people who fought for it, especially as we're still fighting a war in Afghanistan, resonates with fans. As the Journal noted, these players shouldn't whine that people are booing them. Progressivism is a cancer, and it’s spreading into sports. Trump can’t win this culture war? He already won it before the first salvo was fired. Is that a good thing or a bad thing? Many Americans would rather just watch the game, but that’s looking increasingly impossible now.